Its been more than a year since after the 31st update of Mozilla Firefox, users are facing more and more issues every single day. It`s been observed that Mozilla is 80 times slower than other browsers. The worst thing is that rather than solving issues in any new update thing are getting worsen for the users of this browser with every new update. 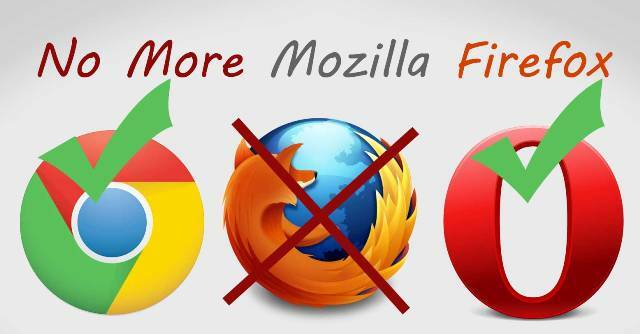 I have been asked many times by my readers that they want to move to other browsers as Mozilla Firefox is not good for them anymore and they ask me to recommend them some other browsers. These are few of the things which are eating the soul of a person who is spending time on internet using Mozilla Firefox only. Even I have checked this issues and found that Mozilla Firefox is more than 80 times slower than Google Chrome and Opera. That means it is the time to switch to other browsers. Why waste your precious time and data on a browser who is not user friendly anymore. The case get more worse if your internet speed goes less than 1MPBS. In this case Mozilla keep on hanging even if you try to share one single tweet. I still don`t know what the authorities or tech guys of Mozilla Firefox are thinking, or may be they do not care for the users who have less internet speed. I urge the company that either they should fix their system or they soon be replaced with the other browsers who are much much faster than Mozilla Firefox. Noone wants to use a browser who just keep on generating temporary files and keep on hanging after every single action. If you are also facing the same issue do let me know. If you have any suggestion, feel free to share via comments.